The East Asia Library in Gowen Hall has a variety of study spaces for different needs. The main reading room is on the 3rd floor of Gowen Hall. 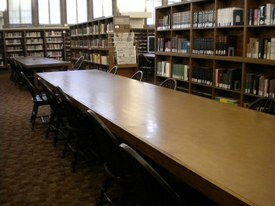 This room contains a number of long tables to be used for quiet study. Electrical outlets (many equipped with power strips) are available along the perimeter of the room. There are also two charging stations for phones and other devices (courtesy of the STF). The reading room also contains computers, scanners, etc. that are available for use. For more information, see the page on Computer, Printing, & Scanning Services. 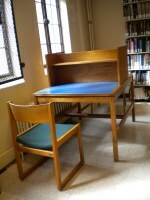 Among the stacks on Gowen Hall floors 1, 1M, and 2, there are study carrels for quiet, individual study. 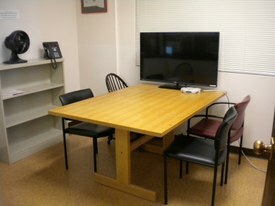 This small group study room is located on Gowen Hall Floor 3. It is equipped with a large screen monitor. (Connector cables and remote for the screen can be checked out from the Information Desk.) The space is available for use on a first-come, first-serve basis. This space is sometimes reserved for classes and East Asia Library events; for more information, check with the Information Desk on floor 3. 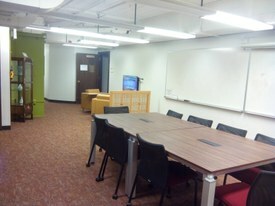 This study area is located on floor 2M inside the library, and can used for individual or group study and for library-related instruction. It is well-suited for discussions, seminars, and similar activities. 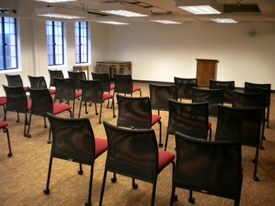 This space is sometimes reserved for classes and East Asia Library events. Check the room's bulletin board or ask at the Information Desk on floor 3 for information.